I have no idea what was going on yesterday but it was a terrible, horrible, awful day. I had spent the night before waking roughly every hour for no reason I can think of. When it was time to be getting up, all I wanted was to go back to sleep. I dressed, ate breakfast, went to the bus stop. All while yawning my head off. My head, which felt like it weighed a ton. Got to work, still yawning, did a 5 hour shift, yawning the whole time. The heavy head developed into a headache, the legs were aching badly, my left hip gave painful tweaks several times during the day. And my brain? Just wasn't working. I felt dull all day, like my brain had left and gone on a holiday. After work, I dragged myself to the bus stop, napped on the bus and almost missed my stop, caught the second bus, finally got home. Yesterday morning I was awake at my usual ungodly hour, sitting in bed, drinking coffee, reading a book, when I had a sudden urge to bake. So I got up and puttered around the kitchen assembling ingredients, then baked a batch of Snickerdoodles. With craisins. When the last few came out of the oven it was finally daylight, so I showered and dressed, then, still feeling the urge to cook something, I made pancakes for breakfast. Then dragged out the Easi-Yo and started a tub of yoghurt. I cleaned up all the dishes, put on a load of washing, and can you believe it? I still wanted to cook! So I made pea and ham soup. That's a soup that takes a long time, simmering until the split peas have disintegrated, then grated carrot and grated potatoes are added along with finely sliced celery, repeat the simmering until the potatoes have disintegrated. This idea comes to us from Kim at frogpondsrock, who realised one day that she takes many more photos thatn she uses, as we all do, and wanted to post some of the older ones on her blog. Only two photos today, and if you've seen them before, I apologise; I just can't find the photos I'd intended to use. 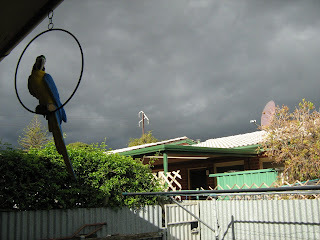 I remember taking these shots about four years ago when I'd looked outside to see bright blue sunny skies, then within the hour these clouds came over, filling the sky so the day became very dark. This is the driveway that leads in from the side street that I use as my entrance. That's my flat on the right. and goes out to the main road, which is also an entrance. The main entrance. even inside some of the secluded courtyards behind each block. This is a view of the garden I can see from my small front porch. It's mostly roses, geraniums and lavenders. There's even a couple of seats under shady trees. The blocks of flats lining the driveway on the main road side have very pretty gardens. I think the people have been living in those for a very long time. There are flowering bushes, green shrubs, pot plants and hanging baskets too. There's windchimes and other pretty ornaments either standing or hanging. People have chairs and little tables on their side or back porches to sit at on a sunny afternoon. This block of flats, two up, two down, is built in a "T" formation. Four flats in front, four flats in the "T" behind, which I didn't take a photo of. Yet. This little bit of the block, is mine. My new home. The balcony above the front door belongs to the upstairs flat. It looks small, and when I first saw it, I worried a little. How on earth was I going to live in this? But once I stepped inside I was reassured. Not a mansion by any means, but plenty big enough. After all, I'm only one person, how much space do I really need? So I'm well settled, the flat is very, very familiar already and after only two weeks I get a sense of coming home when I unlock the front door on arriving home from work. This photo is part of the garden that fronts the complex on the main road side. It's quite a large complex, more than 100 flats altogether, with a main entrance from the busy main road, and another entrance from a side street. You know those places where internet connections are iffy at best and nonexistent at worst? So many days now, when I try to connect, the little green light on my usb stick is red instead and page connections are so slow I could cook and eat a meal and then clean up the dishes while waiting for my emails to load. Today I've tried to connect three times, finally getting a green light just now at 9.35 pm. Of course now I'm too tired to actually bother with surfing the web or reading blogs. "No-one" has mentioned the problem may just be that there are too many homes too close together here in this complex that I now call home. It may just be a case of finding the right time of day to turn on and connect with all my friends out there. For most of this week, the ideal time has been around 5-5.30pm. Last week it was around 7pm. After having ten days off, which included two weekends and moving house, I found myself back at Coles. What with zipping back and forth between the two places, cleaning one for a final inspection, (which went very well), and cleaning the other so I could live in it, I kind of feel like I haven't had much time off at all. I was expecting to be busy, I just thought I might have at least a 3 day weekend to put my feet up. Still it's done now and I can apply for another few days off when I want to. Anyway, back at work....I now have to catch two buses to get there, so clearly I can no longer do the early morning shift. I've heard that my regular customers have been missing me and if I'm truthful, I've missed them too. Remember I said the previous tenant kept birds? Unspeakable grunge that I had to scrape off the floor of the top-of-wardrobe section. I think it was glue that held the cages in place. Bird droppings everywhere. This one on the bathroom windowsill in the enclosed back porch. How about my rangehood? Looks nice and clean? Look inside, down through the grill. More birdseed. How the heck am I supposed to clean that out? The vacuum doesn't reach in there. One of the many cobwebs I've since swept away. Plaster dust left in corners and on windowsills. Thank goodness it's done now. Just have to sweep the dusty cobwebs off the front porch light. A once a week meme seemed like a good idea, so SundaySelections was born and any one at all can join in. 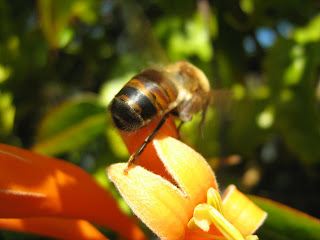 The yellow flower and the deeper gold of the bee. A bright yellow contrast against the blue petals. Pale yellow petals surrounding the darker yellow centre. Bright yellow buttons making the petals look so very white. The palest hint of yellow in the centre petals. So yellow it's almost orange. Licorice Fruit Bites. By Fyna. (I've had some before, but a different brand, and they weren't so nice. All I could taste was artificial flavour and colour. Nothing at all to distinguish one colour from another. But these ones above actually tasted like licorice! And the fruit flavours all tasted different! There's pink, green, yellow and orange. They don't taste like realfruit, but they are still nice. As with most things of this type, the pink colour (flavour?) is the best. Beef casserole with mashed potatoes. With all the goings on involved with moving, I'd been eating things that didn't take much preparation or cooking. I was ready for some real food. ....... means one broken spongebob squarepants juice glass. The rest of the kitchen is almost entirely satisfactory. Well, a low under bench oven means the teatowel hanging on the handle sweeps the floor every time I open the oven door. There's no towel rail, so that's where it has to hang until I get one. I just have to remember to remove the towel before opening the oven. A paper towel dispenser on the wall just beside where the oven mitts are might be happening too. The other corner is a little crowded and I need somewhere else to stash all this stuff. There's no more room in any of the cupboards, so I was thinking of a triangular shelf in the corner, just above the tiles. am I a whizz at unpacking? this....I've lost a whole cabinet from the kitchen. It's on the back porch. A bit more of the bathroom/laundry chaos. the laundry/bathroom is looking respectably tidy. And look at this!! Bookshelves behind the bedroom door!! I'm not sure if the original purpose of these shelves was for books, but they're the perfect height and depth, so that's what I'm using them for. This frees up a couple of bookshelves in the lounge so I can fill them with even more dvd's. Eventually. Well, here I am, for better or worse, in my new home. I was told that the maintenance schedule included repairs, cleaning and painting. Repairs? Well the broken taps over the laundry tub were replaced. The rusty hotplate is still there. Paint? The replacement door has been painted and all other doors and window frames too. We opened the windows immediately to let the paint smell out. Cleaning? Well!! If this is what they call cleaning, I could teach them a thing or two. I signed the paperwork to say I was accepting an acceptably clean flat, while quietly resolving to scrub everything as soon as I was fully unpacked and settled. The top-of-wardrobe cupboard had a few seeds of the bird food variety and also dried bird droppings. UGH! Apparently that's where the previous tenant kept his bird cages. When I first moved in here, I noticed the carpet had some ugly and large stains on it. Now that I'm moving out, I need to get the carpet steam cleaned. The property manager requires a receipt as proof. I'll have it done, but after eight and a half years, the already old and worn carpet is even more worn and not looking so good. In spite of me trying various spot cleaners, the stains remain. The footpaths around items of furniture and from room to room are very trodden down. I'm not sure they'll ever be revived. I'm fairly sure this is the original carpet, installed when the unit was built. I've also noticed, over the last eight and a half years, that this particular carpet, doesn't like to let go of its dirt. I can vacuum for hours in multiple directions, and still have to crawl around afterwards on my hands and knees picking up bits that cling to the carpet. I won't be online much in the next few days. There's work in the mornings, (sigh), then in the afternoon I'll be doing other things. Don't want to do them things. Like sweeping down the walls and washing off marks. Dusting off the light fittings. I'll still pop in if I have a minute or so, even just to check my email and skim a few posts, but if I don't leave comments, I'm sure you'll understand. SundaySelections is brought to us by Kim, from frogpondsrock, who realised one day that she takes many more photos than she uses, as we all do, and wanted to post some of the older ones on her blog. I usually choose a theme for my SundaySelections, but this week, instead, I bring you photos of something I created. When I first moved in here, this is what I found, instead of a kitchen door. Useless at keeping heated or cooled air in. So I made a screen. From a large piece of cardboard, (part of the box my refrigerator had been delivered in) and dozens of randomly selected magazine pictures. remember the monkeys that decorated my christmas tree? (Harvey Banana) What's going on? What are you guys doing in this box? (Hugo) We're moving to a new home. Wanna come? (Harvey Banana) Of course! Move over, let me in. (I keep these boys around for small visitors to play with).